This AidCamp was held in conjunction with our partner organisation SERVE in the community of Ratmalana in Sri Lanka. SERVE works primarily in the areas of social work and education for the benefit of underprivileged and deprived urban and suburban children. 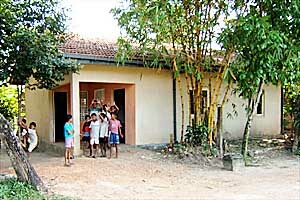 The purpose of this project was to build a children's resource centre to provide a child friendly environment for a mixed community of Sinhalese, Tamil, and deaf and blind children, where they can avail themselves of the facilities for additional studies, to do their homework, use the library, and play indoor games such as chess and carrom. 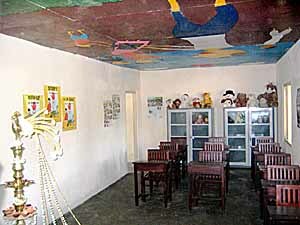 The volunteers plastered, painted, decorated, and generally finished the building. The volunteers were also taken to see SERVE's work for the rural poor in the area, as well as on several local and regional sightseeing trips. "I left England for Sri Lanka with a feeling of definite trepidation. This was the first time I had done anything like this, and I was understandably nervous, but once I'd hooked up with some of the other volunteers at the airport I felt immediately calm and confident that I'd made an excellent decision, and I never looked back. Our main project was to help build and decorate a resource centre for children from diverse backgrounds at a school for the deaf and blind. The somewhat daunting shell of a building we saw on our first day was transformed through a whole lot of blood, sweat and, well...even more sweat into a colourful, personalised, welcoming centre that I know will be well-used and enjoyed for years to come. The creativity, enthusiasm and individual strengths of the volunteers really shone during the three weeks, and we built up an amazing team spirit. We were also blessed with the very welcome watchful eyes, good humour and enviably skilled assistance of some of the deaf students. It was an absolute joy spending time with the students, who patiently taught me a lot of useful sign language and whose intuitive observations frequently had me crying with laughter. During our stay we were able to visit a number of SERVE's other resource centres, learning about the valuable work they do and playing with the children. When the kids demanded we sing for them the best we could offer was the hokey-kokey, which was received with bemused but genuine appreciation. Most of these children's families were incredibly poor, and many had lost everything in the tsunami. I remember being moved almost to tears in one centre by a child's drawing of the huge waves, and we were all shocked by the areas of devastation we saw and the stories we heard. But I was moved even more by the people we met in these centres, their strength and determination to push forward, and their resolve to retrieve a sense of normality for their families. At the weekends we took some time out from the projects to visit some of Sri Lanka's most famous cultural and natural attractions. These visits were an opportunity to unwind, reflect and to see more of the stark, often very beautiful contrasts of this fascinating country. However, they also made me realise how little you really understand of a country as a tourist, and how much more enriching it can be-how much more you discover, learn and experience when you live and work alongside local people. At times I felt more at ease in Sri Lanka than I do in England; at other times I felt overwhelmed. But I never once felt alone or unhappy. With the humour, support and camaraderie of my fellow volunteers and the open-armed hospitality and warmth of so many of the Sri Lankan people we met, I was incredibly reluctant to leave. I would wholeheartedly recommend AidCamps to anyone, regardless of their age or experience. I am proud of what we achieved in these three weeks, which were some of the most challenging and most enjoyable of my life. The sights, sounds and smells of this fantastic country will stay with me, but it's without doubt the smiles of the children we met that will be my most enduring memory." "This trip was a massive eye-opener in so many ways. I learned so much about developing countries, about Sri Lanka and about myself." "It was a great opportunity to mingle with local people and learn how similar/dissimilar our mutual lives are." "If you've ever wanted to do something for charity, but never have, I would recommend AidCamps International as it is a very fulfilling experience." "Had an amazing time, better than any other travelling I've done. What made a big difference was the Sri Lankan people who were so welcoming and loving." "It was a fantastic experience and one I will never forget." 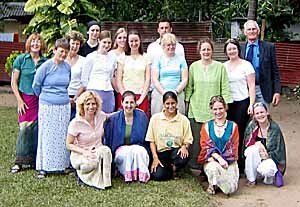 "My experience of Sri Lanka and AidCamps has been the best ever. Thank You!" "A brilliant experience in a fantastic location with caring staff and fellow volunteers." "I loved it. It will affect my future." "It was a brilliant experience. The project was great and I felt that I really learnt about Sri Lanka. I will definitely be doing another AidCamp!" "A wonderful experience even for a nervous traveller. Thanks." "Very special - very generous welcoming people." "An experience like this changes you for ever." "The last few weeks have been the hardest and best of my life. No doubt." "Lovely people, lovely country and the AidCamps formula worked very well here. A memorable and moving three weeks." "It's one way to learn the mysteries of plumbing." "This trip was a massive eye-opener in so many ways. I learned so much about developing countries, about Sri Lanka and about myself." "It was a great opportunity to mingle with local people and learn how similar/dissimilar our mutual lives are." "If you've ever wanted to do something for charity, but never have, I would recommend AidCamps International as it is a very fulfilling experience." "Had an amazing time, better than any other travelling I've done. What made a big difference was the Sri Lankan people who were so welcoming and loving." "It was a fantastic experience and one I will never forget." "My experience of Sri Lanka and AidCamps has been the best ever. Thank You!" "A brilliant experience in a fantastic location with caring staff and fellow volunteers." "Tourism it is NOT." "I loved it. It will affect my future." "It was a brilliant experience. The project was great and I felt that I really learnt about Sri Lanka. I will definitely be doing another AidCamp!" "A wonderful experience even for a nervous traveller. Thanks." "Very special - very generous welcoming people." "An experience like this changes you for ever." "The last few weeks have been the hardest and best of my life. No doubt." "Lovely people, lovely country and the AidCamps formula worked very well here. A memorable and moving three weeks." "It's one way to learn the mysteries of plumbing."